A lectern can be as simple or stylish as you prefer. 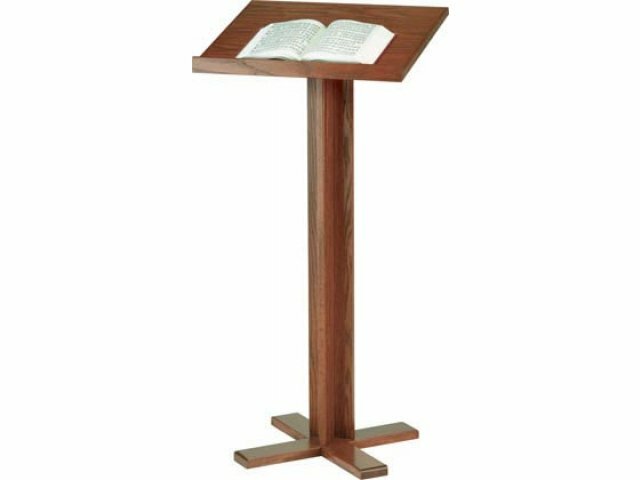 This basic lectern has a northern red-oak core cross base for added stability. The top core is medium-density fiberboard with a veneer finish that seamlessly matches the base. An edgeless reading surface with raised book stop keeps your books and speaking materials under your eyes but out of the line of sight of your audience. 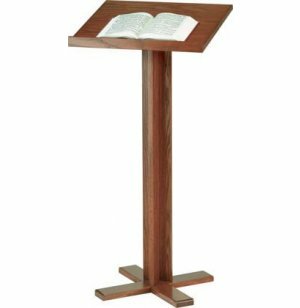 With a simple but elegant design, this lectern is perfect for the church sanctuary or lecture hall. Coordinated Materials: The reading surface features a medium-density fiberboard core with a Northern Red-Oak Veneer finish that matches the base. Easy Reading: The angled reading surface makes it easy for speakers to see notes. Practical Design: Book stop prevents notes, papers and books from slipping off of the podium. No-Tip Base: A solid, Northern Red-Oak core cross base keeps this lectern standing tall. Note: Priced in full wood stain; call 888-793-4999 for pricing in Colonial White.